In this issue of WHOTT Web News we take a brief at Railway Bus Services and Just the Ticket. 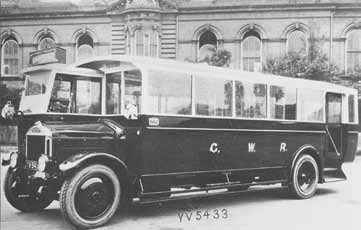 Railway Bus Services - Part 3 – Initiating the Act of change - During 1927 the National Omnibus & Transport Company made significant strides to expand their west country network of services. This they mainly achieved through the acquisition of some important bus companies that covered large tracts of territory, particularly in North Devon and North Cornwall. Apart from the two cities of Plymouth and Exeter, and the National Electric Construction Company’s area covered by Devon General, much of the remaining territory was already in the hands of the DMT/CMT companies and the bus services provided by the GWR. In order to secure some benefit, both from the company’s point of view and that of the travelling public, it was considered worthwhile pursuing the possibility of acquiring more services in the area or even coming into a closer working relationship with the incumbent operators. 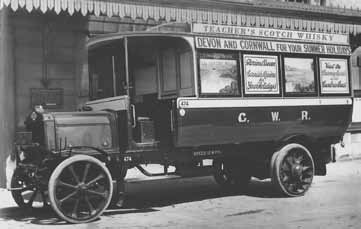 This policy was richly rewarded in the eventual acquisition of the entire DMT/CMT companies which took place on 1st January1928, bringing 120 vehicles and over sixty bus services into the National’s Devon and Cornwall area. Mention must first of all be made to the significant contribution DMT made to the bus services of Devon and Cornwall. The acquisition of the Devon Motor Transport company, and its Cornish subsidiary, CMT, was considered to be one of the finest single company purchases ever made. “Never before had a company been found so well run in all its departments as that of the DMT”, read a statement by the National. Set up at Okehampton in 1919 by a retired naval commander, F T Hare, it got under way using former army lorries of Wolseley manufacture and prided themselves by employing only ex-servicemen. This instilled discipline and fostered a spirit of camaraderie among the employees, gaining much support and loyalty during its formative years. After setting up in haulage work Hare started using some Mumford bodied AEC chassis on services to Exeter, Hatherleigh, Tavistock and Launceston. Major Colfox (Hare’s father-in-law) joined the board and new areas of operation were sought as the company tried to expand. Early in 1921 premises were taken at 6 Torridge Place, Bideford and three routes started, in competition to some degree, with Dymonds of Bideford and Colwills of Ilfracombe. About the same time a bus was stationed at Moretonhampstead from where it ran on different days to Newton Abbot, Okehampton and Exeter which was later extended to Honiton in competition with Devon General. By the end of 1921 two of the Bideford services had been withdrawn but another had been started on the over-bussed route to Westward Ho! Early in 1922 a haulage depot was established at Bath Place, off Union Street, Plymouth and soon afterwards the bus service between Okehampton and Tavistock was also extended into that city. The company found fresh scope here by starting a service to Plympton and Ivybridge and another to Tamerton Foliot. In December 1922 the Bideford depot had been closed and the service which had been run from there to Exeter was taken up by the Bideford Motor Company. In the previous month, however, the DMT was faced with the threat of new competition from a company calling itself “Plymouth & District” which, on 13th November 1922, advertised a service between Plymouth and Totnes and another between Plymouth and Elburton issuing a timetable that required three buses. In the following March Plymouth & District announced that it would be starting a third service between Plymouth and Yelverton using a red doubledeck bus. DMT challenged this in the summer of 1923 by stepping up their frequencies on the Yelverton and Plympton services, and on the Ivybridge and Totnes service in the following October. Although unconfirmed, it is firmly believed that the intruder was Hardy Colwills masquerading under a new title ‘Plymouth & District’. No doubt they had been affected by DMT’s incursion into North Devon and saw a greater potential in running in the lucrative area of Plymouth. Hardy Colwills had depended largely on vehicles of Leyland manufacture and now obtained a new weapon in their arsenal, at the time claimed to be the largest double-deck in the country. It was delivered to Minehead on 15th June 1923 and next day driven over Porlock Hill to Ilfracombe and on to Bideford where, it is claimed, they started a service with it to Plymouth. However, research has yet to uncover sufficient evidence that this service actually commenced, though we know that the vehicle did reach Plymouth and was used on the services there. Seating 64 passengers and of the overtype design, it must have been a formidable vehicle to compete with at that time. The GWR advertised extensively the delights of their territory that included the long coastlines of Wales and the west country. AEC YC number 474 (XN2269) was allocated to this duty, forsaking its bus journeys for a tour of the northeast of England and Scotland, attracting patrons from far and wide. Maudslay 1552 (YV5433), one of a large batch with Vickers 32-seat bodies delivered in 1928. They were allocated in various parts of the Great Western territory, this one from Penzance. It would eventually pass into the Western National fleet. Just the Ticket 20 - Once again the front and back of two wartime tickets are shown but it will be noted that they are not universals. What is more they have been printed by the Punch and Ticket company. Tickets of this type were for values 3d, 4d, 5d and 6d only and as the lowest value of an adult return was 5d the 3d and 4d tickets were only for children. For the most part these low value tickets were usually printed by P and T and those from 7d upwards by Williamson. Although these tickets are just as long as those in JTT 19 the fare box is once again of conventional shape. IP 7486 carries TS number 9 and dates from 1940. As the stub has been removed from S 18 4369 it is not possible to say when it was printed however the quality of the paper is vastly inferior to the former and its serial number starting with S 18 suggests that it dates from late in the war or even after the war. The punch holes on Ip 7486 show that it was issued to a child who boarded at stage 6 on the 28th of the month. As there are no cancellation punch holes and the stub has not been removed it can be assumed that the return portion was never used. Examination of the other ticket shows that it was issued to an adult and that the return journey was made in the evening of the same day as the outward journey. The hole above S 18 indicates this. As required the stub has been removed and handed in for audit purposes. Bedford YRQ / Duple Dominant (PLG367P) at Calstock in June 1991 on the Tavistock service. 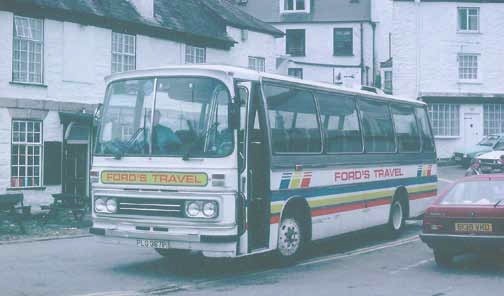 This vehicle was new in April 1976 and Ford acquired it from Cooper of Stockton Heath in June 1990. By December 1991 it had passed to Meeds of Tavistock.